The scientists say they hope hogs produced with the gene editing technology will be on U.S. dinner tables in a matter of years. 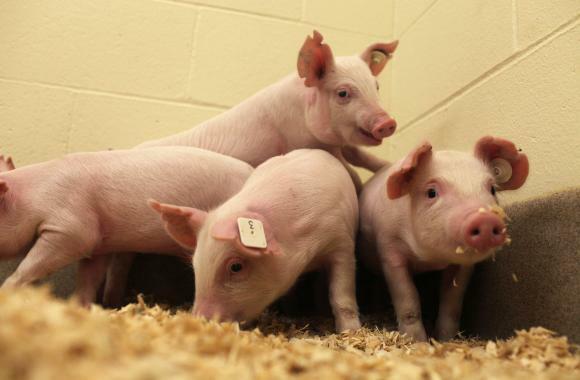 That hope rests on garnering approval for the biotech pigs from the U.S. Food and Drug Administration, which won’t be an easy task. There is just one animal currently approved for marketing in the U.S. – a salmon that has been genetically modified to grow twice as fast as wild salmon. It took decades for the company that developed the fish, AquaBounty, to gain approval. The company faces a new setback, in fact, in that the FDA issued a ruling Friday that may block its sale for years. Scientists have developed genetically engineered livestock in the past and there are other genetically engineered animals in the works, from hornless cattle to hypoallergenic cows. None have yet made it to stores, largely because of the novelty of the underlying technology, which is expensive and un-tested by regulators and consumers alike. “The animal breeding community is looking to see what the response of the regulators is going to be to this technology,” Van Eenennaam said. There is no one-size-fits all study that will quell scientific concerns. Each animal and genetic modification is different. Opponents of genetic engineering in animals argue there are too many risks and too many unknowns associated with GE animals. They worry about environmental impacts and changes to human health. Products of GE animals are not currently required by the FDA to be specially labelled, though the agency did issue draft guidelines for a voluntary labeling initiative. Sen. Barbara Murkowski of Alaska has threatened to battle the confirmation of a new FDA commissioner over the agency’s safety and labelling decisions of GE salmon. When it comes to the PRRS-resistant pigs, researcher Whitworth says Genus, the company that purchased the technology, will do the hoop-jumping for federal approval. “They’ll look at feed efficiency and growth and they’ll introduce the edit into their genetic lines,” she said. And if that happens, it likely won’t be long before the pigs are in grocery stores across the country.